Each budget contains one or more positions. The level of detail that your budget is broken down into is completely up to you. Open a project with the existing budget. For more information on how to create a budget, see Create and edit a budget. 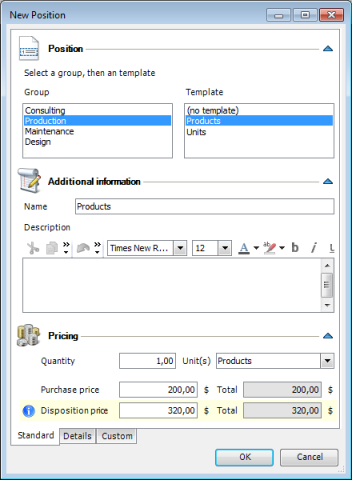 In the project, in the Start tab, in the Section group, click Budgets. On the Budgets page choose a budget from the budget list, to which you want to add a position. Click New Budget Position or Edit Position. Select one group from the Group list to which the position belongs. The group defines the structuring of position within the system. The groups can be customized under InLoox PM options. For more information see Generate and edit groups. Select the position you want from the Template list. For more information on how to create budget positions for template, see Manage budget positions for templates. In the Name field type a name to change the short position name. In the Description area you can add the important information on this position. InLoox PM provides you with the range of the formatting features. For the detailed description see Create and change comments in the Customize comments section. In the Pricing area all the fields are filled out automatically, if you have chosen the position with the already added price model. For more information on how to set up the standard pricings model, see Manage budget positions for templates. In the Quantity field enter the quantity of the selected item, e.g. 95 or 2.34. You can also issue a credit items by entering a negative amounts. In the Unit(s) enter a value. The selected unit is linked to the according price per unit. Select a unit, if there is more than one, or change the unit price manually. All prices are without VAT because InLoox records only net earned premiums. Enter Purchase and Disposition price. In the Total field you can see now the position amount ("Price per unit multiplied by quantity"). In the Performed by field click to add a person's name, who creates this budget position document. Use quick selection to add a new resource. Click Arrow . You can see in the drop-down list all resources, which have been added to the project. In the Provision date choose a date for the provision services or delivery date. This date is set automatically as a start date by actual expenses (time tracking) for the time tracking item. Select the Billed control box. Only for the position of the budget types actual expensesor planned expenses. This is set automatically once the position (or the entire document) has been billed. Select the Billable control box. Only for the positions of the budget types actual expensesor planned expenses. The positions with this status are not included in the actual revenues. For more information on how to add a new custom field in the InLoox PM system see Create custom fields. An internal price per hour is in file for each group. The internal prices and the available groups can be customized under Generate and edit groups. Copy positions to be more efficient instead of adding them, if a project contains already budget information. Copy one single position via the commands Copy and Paste from a budget of one project to another budget (optionally of the other project) within a project. Cross-project copying enables you to reuse positions which have already been created somewhere else. These commands are available on the Budget Positions tab, in the Budget Positions group. Copy all position of one budget type with the help of the commands Copy and Paste on the Edit tab, in the Budget group. Copy position from one project to another via the Windows clipboard. How to add and edit budget positions in InLoox PM 7 • Copyright 1999-2019 © InLoox, Inc. All rights reserved.